In Japan, December is called shiwasu, which literally means “ even teachers who are usually self-composed run around”. Actually Japanese people run around a lot to welcome a new year with a clean state of mind. Therefore, osoji (big cleaning) is to be done and finished by December 31st (omisoka) to remove clutter and dirt from the old year andto purify the home for the coming year .Behind this is that years are considered completely separate with each new year providing a fresh start. This rather recent custom is a TV music show broadcast by NHK featuring many of Japan’s most popular J-pop and enka(Japanese ballade singers of the year. Joya is the night of New Year’s Eve. Just before the midnight, temples throughout Japan strike their big bells 108 times, once for every human desire. The peal of a large bell on joya is called joya-no-kane. ringing out the passing year and ringing in the coming year. After the all busy work, Japanese people welcome New Year’s Day quietly with their families. January 3rd, excluding some retailers. Families usually gather to spend the days together. The occasion has been celebrated for centuries with its own unique customs. 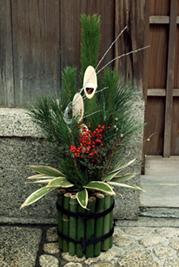 Kado-matsu, New Year’s decoration are set up on both sides of front entrance, consisting of pine and bamboo. Pine boughs are symbolic of longevity and bamboo stalks, of prosperity. Osechi-ryori , a special dish Japanese people eat during the New Year celebration. A variety of ingredients such as fish, black beans and rolled kelp are used. They are cooked in a way they can keep long and served in a set of layered lacquer boxes. 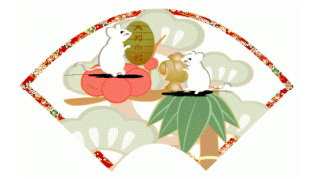 Mochi (rice cakes) are also eaten during the New Year celebration. Nengajo are New Year’s Greeting postcards sent out for wishing their friends, relatives and customers a happy New Year. This is similar to the Western practice of exchanging Christmas cards. The postcards usually have the Chinese zodiac sign of the New Year, as each year is represented by an animal. The animal is boar for 2007 and mouse for 2008. Even with the rise in popularity of email, the nengajo remains popular in Japan. Otoshidama is the New Year money gift given to children by their parents, relatives or acquaintances and handed out in small, decorated envelope. Children look forward to receiving this, so that they can buy something they want. Hatsumode is the first trip to a shrine or temple to pray for happiness and good luck in the coming year. The most famous temples and shrines such as Tokyo’s Meiji Shrine attract several million people during the three days from January 1st to 3rd,which reflects Japanese tolerance toward religion.